My local arts organization, the Cultural Arts Alliance of Walton County, FL, produces an annual exhibit called One Size Fits All. The Call for Art stipulates that art is to be produced on 10×10 cradled wood panels 1.5″ deep. Participants can submit two panels, using either side, creating any kind of art or craft that they want. The panels will be hung at the Foster Gallery at the Market Shops in Sandestin, and will all be offered for sale for the low price of $125. The Gallery will take 40%. The artist may hang another panel in place of the ones that sell. Most of the artists who produce art for this show, put in far more value than $125, just for the fun of coming up with something creative and new. This year I produced two antiqued photo transfers and today I painted a third panel, a beach landscape, en plein air. I was painting with the Emerald Coast Plein Air Painters at our weekly outing this morning. Our location was Beasley Park, on Okaloosa Island in Fort Walton Beach, FL. The sky was dark, but the sun was peaking through, highlighting the grasses on the dunes. Three or four old fence posts wandered up the dune, and a mockingbird perched on top of the nearest post. The scene was exquisite. The sun played with the scene off and on all morning, and painting was a delight from the beginning to the end. Below are my three panels for 2016 One Size Fits All. I will turn in two, and have the other ready when one of the first two sells. Below are pieces I have done for One Size Fits All in years past. The clouds were threatening when I arrived at our painting location last week, at Baytowne Marina in Sandestin, Florida. The rain was predicted to come later, but I had driven through a good shower on the way over from my home in Point Washington, and I was pretty sure we were going to get another one. The marina waters were glassy flat, beautifully reflecting the docked boats. It reminded me of my experience the last time the Emerald Coast Plein Air Painters painted here, in early September. That day was beautiful. Overwhelmed by the geometry of the boats and the reflections, I painted the subject with only squares, triangles, and lines (at right). But last week the weather was not so nice. After shooting a few photos of the marina, I took a walk along the shoreline boardwalk only to have the rain start. I returned at a faster pace and found a blue triangular tarp stretched over a kiosk, for shelter. It leaked. The shower only lasted about 15 minutes, and the trees were still dripping when two of the painting group, Ed Nickerson and Celeste Jones, came strolling up warm and dry. Clearly their shelter was superior to mine. Judy Dewar joined us, and we had a wonderful day of painting, critiquing, and lunch afterwards at the Baytowne Marina Cafe, which was the subject of my painting, below. Today I loaded my painting backpack into my pickup before daylight, had my coffee, checked the news, and then started driving to my intended painting location when raindrops started falling on my windshield. I prefer fair-weather painting, and even better, I much prefer sunny days. So today I changed my plans, and instead, scouted a new location. There used to be a causeway over Oyster Lake, one of the rare coastal dune lakes found here. It regularly used to flood, and it prevented free flow from the marshy headwaters. So the county removed and replaced the causeway with a footbridge, and the view of the shallow marsh from the footbridge is unbeatable. I took a few photos, with plans of returning. 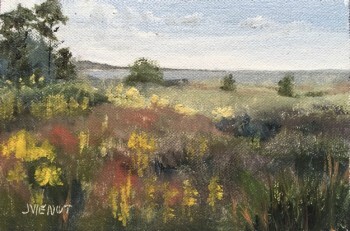 A good plein air painter can find something interesting and beautiful in just about anything he or she looks at, but it’s nice to paint things other people instantly find beautiful too, at least if I want to sell my work. So I always have an eye out for typically beautiful landscape scenery. This location was the mother lode. I took shots from several different viewpoint, a few in black-and-white to make note of the values that the camera “saw”. I make note of that because the camera never sees things the way a person does, but it “takes good notes” when I am in a hurry. I rarely return to the studio to paint, prefer the immediacy of plein air painting.Taking photos merely helps me remember places I want to go back to. Don Demers, one of my workshop instructors last week, tongue in cheek, said “Plein air painting creates bad drivers.” He explained the hazard, that as a practicing plein air painter, one could be driving along and become mesmerized, staring at the shape or color of something, perhaps even something so interesting as the shadow of an underpass. We all laughed of course, but I recognize the truth of his statement. After practicing plein air painting for 8 days, I can’t look anywhere now without noticing wonderful value contrasts, delicious color intensities, and patterns of light leading my eye through compositions waiting to be painted. The first workshop I attended was by invitation. Twelve painters were selected to be in the “pilot” course for the Apalachicola School of Art Plein Air Academy. Master plein air artist Don Demers is designing the curriculum, and Joe Taylor of the Apalachicola School of Art is planning the logistics. Together they will come up with a course to be offered as professional development for the advanced plein air painter. Don spent a good bit of time talking with each of us, as well as offering constructive tips with our paintings. Of most practical value to me was his suggestion to set intention before starting a painting, and then to stick to that intention. He suggested we draw “thumbnail sketches” of our intended paintings first, studying the value relationships and evaluating whether the composition would work as a whole, before we spent 3 hours painting it. Some of my sketches progressed into paintings, some were mere studies of shapes or ideas discarded as perhaps too complicated or logistically difficult (the one above left required me to stand in an ant pile; the one above right was too complicated for my limited knowledge of fishing boats). I completed two paintings and a couple of studies in the Plein Air Academy workshop. Integrating what I am learning is always difficult — there has to be a period of intense, grinding focus, because painting is for the most part so visceral, and newly learned information so very intellectual. I found myself completely exhausted by the end of the first several days. I must have had every muscle in my body tensed as I tried to incorporate what I was learning. I literally came home, ate supper, and went straight to bed, for the first 3 days. Here are a few of my paintings from the Apalachicola School of Art Plein Air Academy workshop. Over the next few days I attended the Forgotten Coast En Plein Air event workshop with Greg LaRock and Ken Dewaard. I wish I could remember everything they said. It was fun to watch the different approaches of two accomplished artists. Both were very strong on compositional tips. LaRock often mentioned ways to lead the viewer’s eye through the painting, and Dewaard pointed out subtle color changes to look for, like the change in the tint of shadows depending on how much of the sky color they might be acquiring, or how much of the color of the ground. Hopefully I absorbed a lot of it, even though I can’t recite it. Below are the paintings I produced during their workshop. In the first one, my challenge was to make the pile of rubble, mostly chunks of concrete, look interesting, like a rocky shoreline. The paintings of the boats and of the shirts for sale both challenged me to simplify. I actually had energy to paint a few small studies outside of class, the last several days, below. Apologies for shooting the photos slightly crooked! And now back to my day-job! But the shadows of those underpasses are starting to look mighty interesting! !